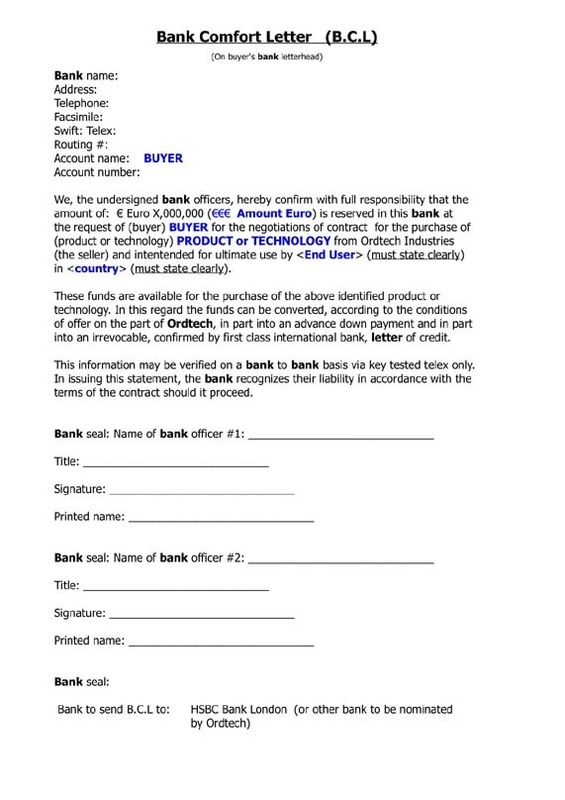 We, the undersigned bank officers, hereby confirm with full responsibility that the amount of: Euro X,000,000 ( Amount Euro) is reserved in this bank at the request of (buyer) BUYER for the negotiations of contract for the purchase of (product or technology) PRODUCT or TECHNOLOGY from Ordtech Industries (the seller) and intentended for ultimate use by <End User> (must state clearly) in <country> (must state clearly). These funds are available for the purchase of the above identified product or technology. In this regard the funds can be converted, according to the conditions of offer on the part of Ordtech, in part into an advance down payment and in part into an irrevocable, confirmed by first class international bank, letter of credit. This information may be verified on a bank to bank basis via key tested telex only. In issuing this statement, the bank recognizes their liability in accordance with the terms of the contract should it proceed.